Constructed 30 years ago as a couple’s getaway, the timeless modern structure is now home to a family of three that cares as much about family-friendly living as they do maintaining architectural integrity. Carved into a steep grade the home has picturesque, panoramic views of lush treetops and a large pond situated at the base of cascading stone outcrops. 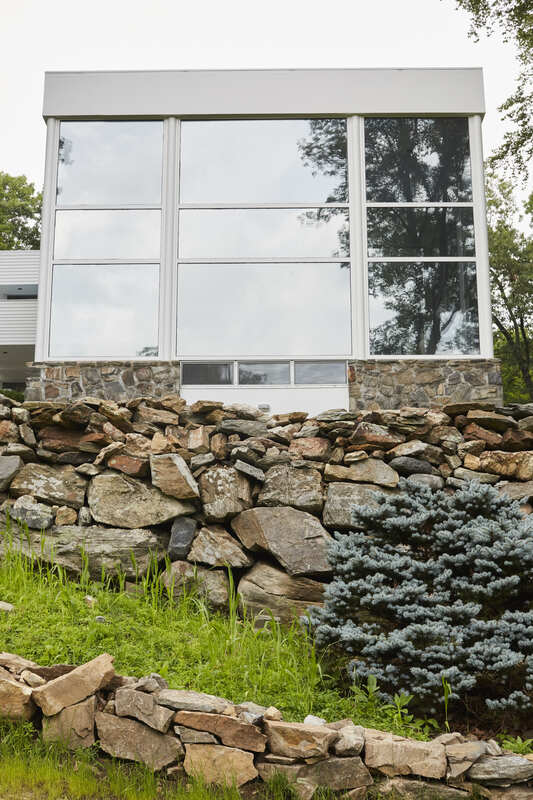 Because it's built on a hill, each of the home’s three floors are on-grade, allowing outdoor access from each floor. In their renovation, the couple moved mechanical systems out of the lower level and into the garage, reclaiming 1,000 square-feet of living space while also incorporating a sound-proofed recording studio and guitar storage room. When the homeowners set out to renovate the home to fit their lives as new parents, the Manhattan couple looked to the original architect, John Ciardullo to maintain the character of the home while at the same time creating additional entertaining spaces and particularly an updated kitchen that reflected their collective creativity. The kitchen sits inside The Pavilion that juts out into the landscape over a large multi-level bluestone patio ringed with moss and dense grasses. 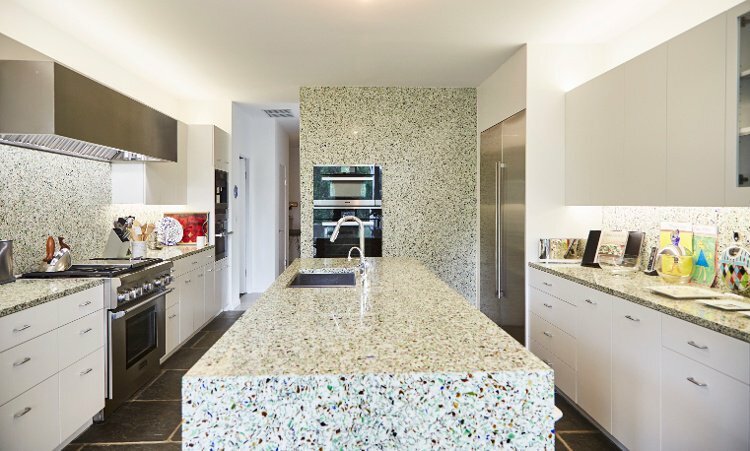 The design incorporates an unusual mix of materials such as cleft bluestone paver floors that transition from exterior to interior, white lacquered cabinetry and Vetrazzo recycled glass countertops. The rustic and contrasting texture of the bluestone flooring paired with the smooth and sleek waterfall island of glass and lacquer gives you the impression that nature has made its way in, under the floor-to-ceiling glass windows or that somehow this great, glass box grew out of the hillside over time. It feels at once organic and orchestrated. Cleft face bluestone pavers extend from the terrace into the kitchen, unifying the space. Pre-reno, the kitchen countertops were a drab Uba Tuba granite, the same material used for the home's two volumetric fireplaces; a durable material but one that seemed dull and dated to the homeowners. “We had originally intended to brighten it up by using white marble for the countertops and paint the walls white,” the couple said. That is until they stumbled upon a large Vetrazzo recycled glass panel on the wall of HG Stones' showroom in the Flatiron district, NYC. From there the whole design took a dramatic turn. 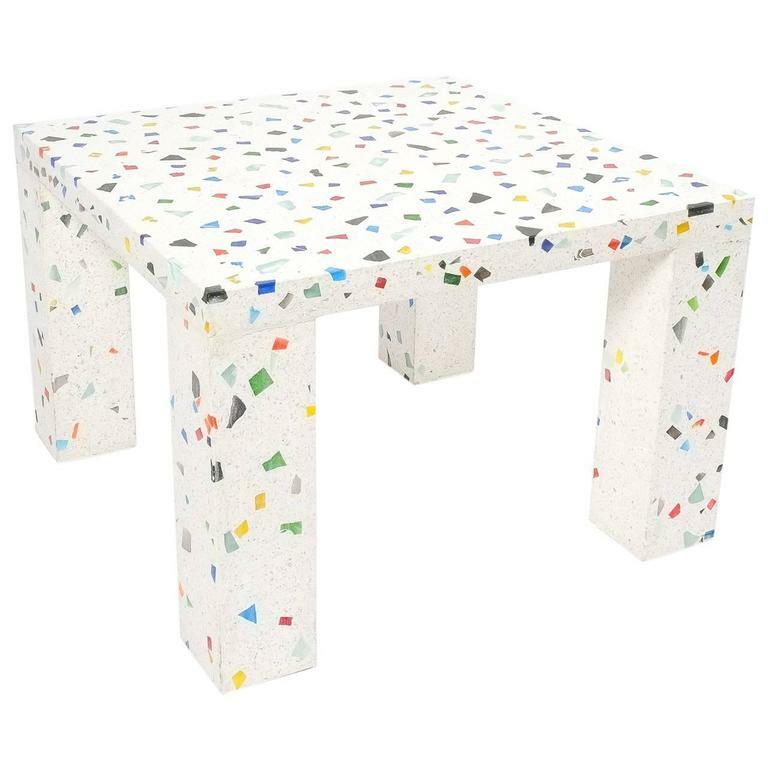 Here was the dynamic color connection they needed to bring the outdoors in, plus serve as an homage to their favorite terrazzo table from their old New York City apartment that now sits in the heart of their new recording studio.  Terrazzo table by Schiro Kurumata was the inspiration behind the Vetrazzo kitchen design. And just about everywhere is where they used it, on the walls, the kick panel, the waterfall ends and the full backsplashes. Moss’ wisdom worked. 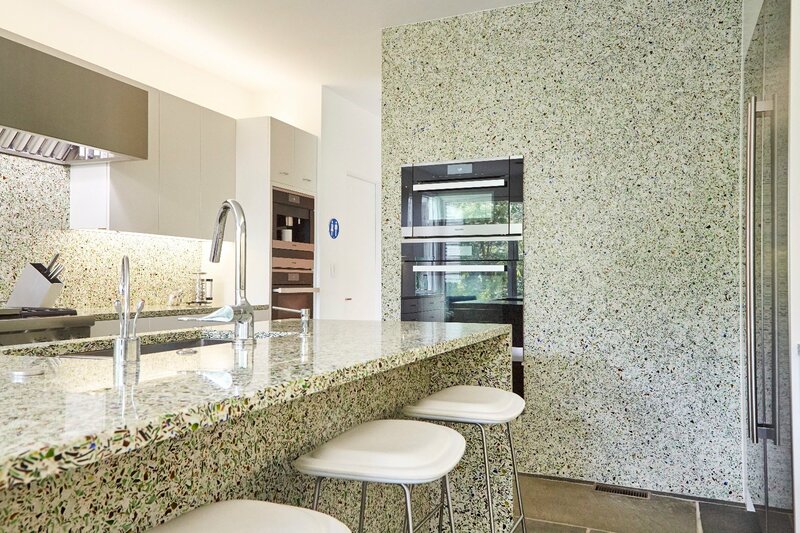 Initially, the homeowners intended to use Bistro Green for the countertops and backsplashes fearing the material might be too overpowering with the saturated color of the crushed glass aggregate. 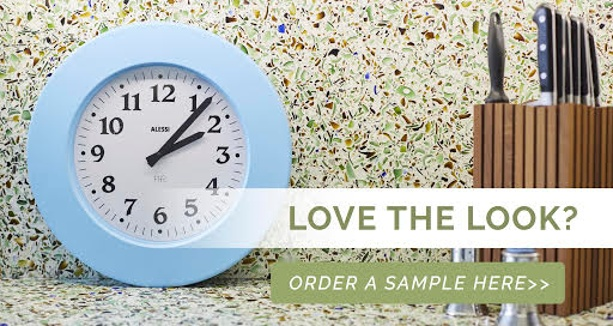 Moss, a renowned designer, inspired them to go beyond the standard countertop application. 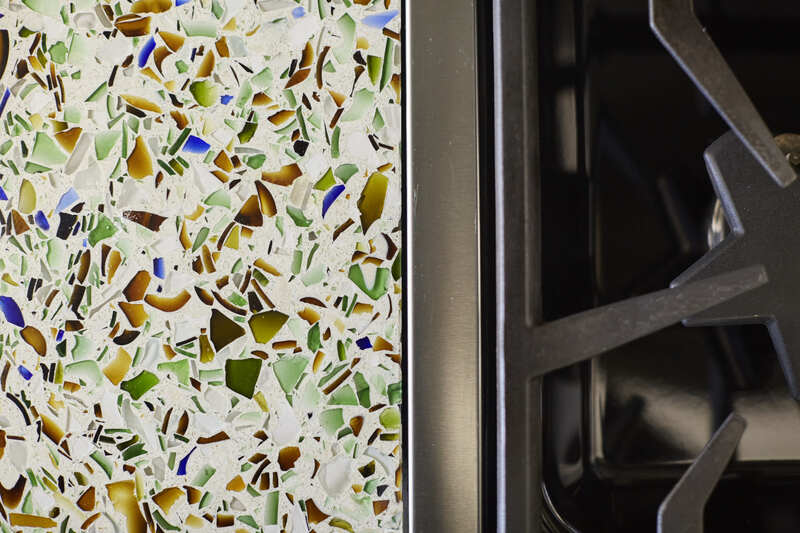 Vetrazzo can sometimes be thought of as a busy material, but when paired with the right finishes and details, like in this design, it’s not overwhelming - even on a large scale. Rather than overpower the space, the bold pattern, filled with color and movement, makes the kitchen cohesive and lively. The simple white cabinetry and sleek appliances are its elegant, understated companions. Case in point is the expansive full wall that wraps back to the hallway adjoining the kitchen to the front entry. The area was covered with full slabs extending from floor to ceiling and the corners were carefully mitered, each cut to a clean 45° angle to give it a seamless, clean-cut appearance. Thanks to the skilled work of fabricator Stone Decoration, Inc. the final result is impeccable, complete with precisely located cutouts for the professional Miele double wall ovens. The island is wrapped all around with waterfall ends and solid back panel, framed by the large feature wall. The island is a work of art in itself wrapped entirely in slabs of the material. The top and waterfall legs are joined by a seamless miter joint that adds to the feeling of the top being one solid piece. The backsides of the overhang portion of the waterfall ends were mechanincally polished to match the factory finish of the face. Additionally, the back panel of the island where the stools are located is a covered with a solid vertical piece of the Bistro Green. The look of the Bistro green countertops and backsplashes pairs well with the white cabinetry and especially with the contemporary kitchen appliances and plumbing fixtures: Thermador range and microwave, BLANCO STEELART undermound sink, Hansgrohe AXOR faucet, and Sub-Zero refrigerator and wine cooler. 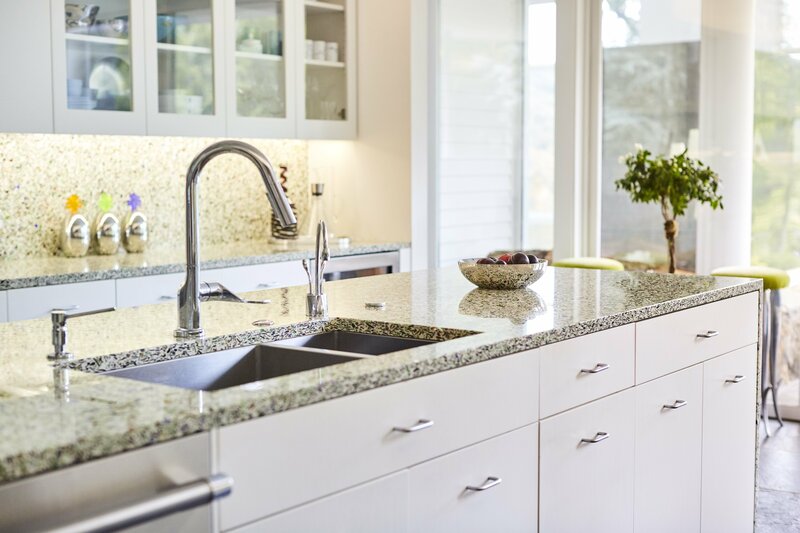 A professional Thermador range frames the Bistro Green counters. 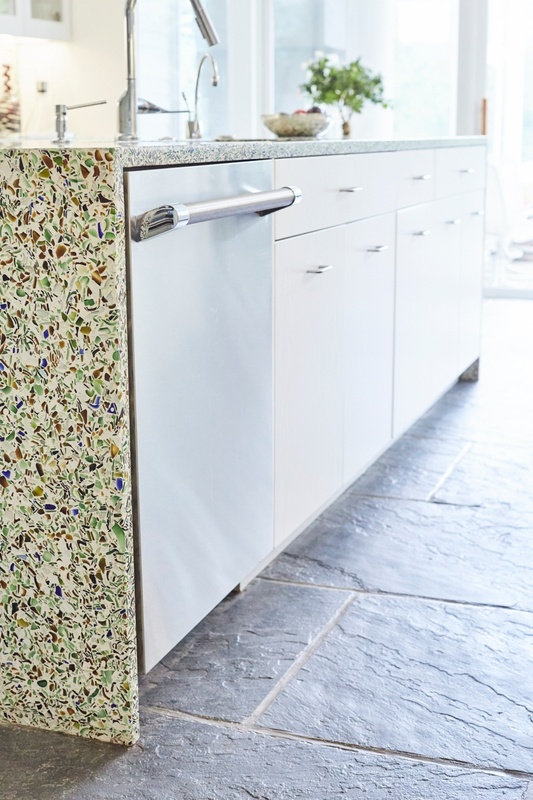 Vetrazzo’s durability, its composition of recycled materials and its uniqueness were all factors that drew the couple to the material for their kitchen, but it was the color that moved them the most. 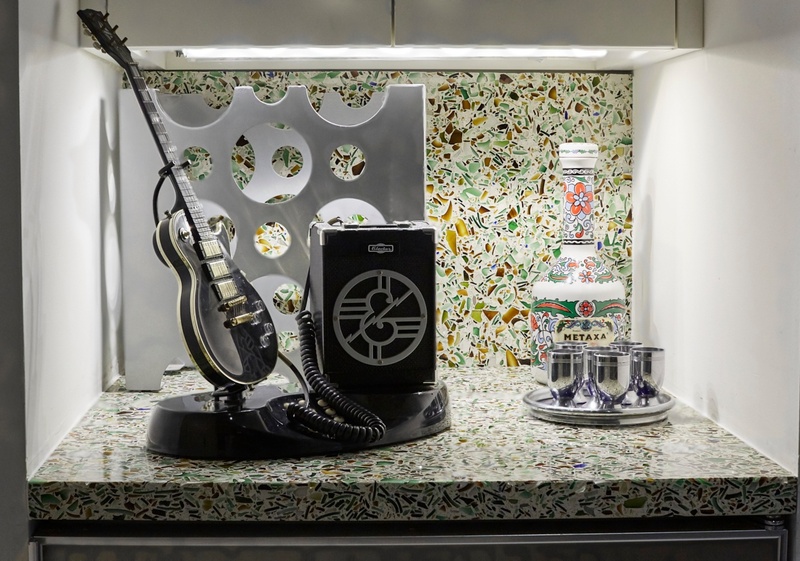 Vetrazzo recycled glass was even incorporated into a bar nook in the recording studio. The kitchen-in-the-cube with its lively green color allows this family to feel as if they’re forever sitting outdoors, no matter what the season. Add a dynamic green to your material program. Click here to order a sample. They're free to the trade.